The real estate sector is one of a handful of industries leading the charge where it comes to Virtual Reality and Augmented Reality technologies. VR and AR, as they’re often called, can be used to capture imagery of existing homes and buildings, which can then be used to create “virtual tours” of those properties. The technology can also be used for buildings still under development, showcasing how the interior of those properties will look once construction is completed. Some real estate companies have already adopted VR and AR technology. 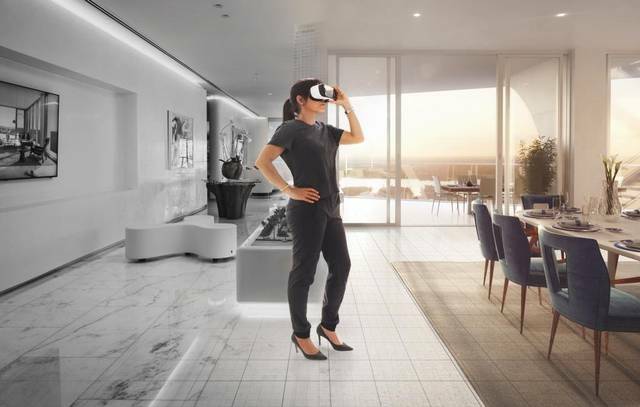 Most recently, luxury residential real estate brokerage Surterre Properties said it was teaming up with RoOomy to offer virtual tours of its new developments. Other companies such as Matterport and Scouting Owl have also built hardware for real estate marketers to create 360 degree video footage of their property listings. Unfortunately the high cost of VR and AR equipment means that adoption has remained fairly low up until now. Most consumers don’t own their own VR headsets, while the costs involved means that it’s so far been fairly limited to just higher-end properties. But financing for companies making VR solutions is on the rise, and that should eventually see costs coming down. Analysts forecast that the VR and AR industries will be worth $75 billion a year by 2021, while data from CB Insights reveals that VR and AR startups were funded to the tune of $2 billion in venture capital in 2016. What all this means is that VR adoption is set to expand rapidly, and could soon reach the mass market. Just as with PCs, which were once considered a luxury, declining costs and increased investment should ensure that VR technology becomes much more affordable in the coming years. Once that happens, the demand for virtual spaces will only increase, until it becomes something that real estate marketers simply cannot ignore. It’s likely that once the average consumer embraces VR, the way in which we view property listings will change forever. Consumers will demand VR tours and will expect to see them offered online alongside listings. As such, real estate agents will need to think about how they can best leverage the technology to sell houses faster. The technology will make it possible for them to show off their listings to clients without ever stepping foot inside it, with real, in-person home viewings reserved only for those who’re seriously considering buying the property in question.